I have up until now done an initial weight an balance exercise and determined that the ideal C_G to be at FS76. The Neutral Point is located at FS 79.5. I have also analyzed the Eppler1230 airfoil against many others, but none have the desired L/D polars as it. 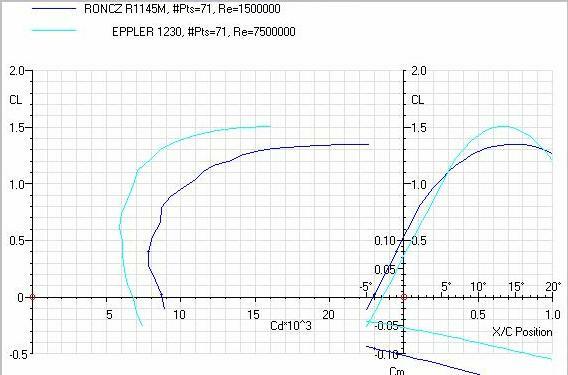 The Roncz R1145MS was also analyzed and proves to be the best so far for use as a Canard. At this stage I am still having difficulty in determining the shift in NP due to the increase in C_l of the canard. I used the formula as suggested by Hollmann, there seems to be an unusually large shift of the Center of Lift much beyond the CG. The Canard needs to produce C_l 2.8 to maintain lift at 65_Mph.